To celebrate the opening of the new gallery space on Rivington Street, Stella Dore Gallery have released the Eine – Exciting screen print edition. 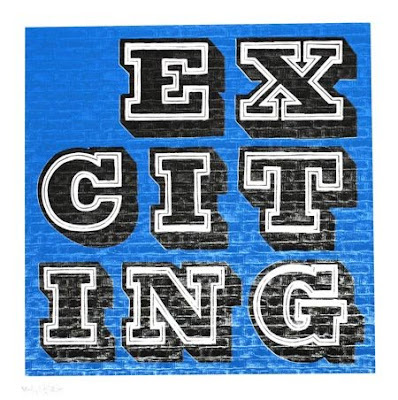 This "Exciting " print is and edition of 150, 70x 70cm, two-colour hand pulled screen print printed on white archival paper, with brick relief effect, signed by the artist, embossed and numbered.Available now at Stella Dore for £95.00. Also released is this new print from Cept.It's a three colour hand-pulled screen print, on blue archive paper hand finished by the artist. Each edition is slightly different to the others because of the nature of the hand finish. Some of you may recognise this image as the original recently sold in Bonhams. The "Villainry" print is an edition of 14 and is available here for £350.